ROCKSPRINGS, Ohio — St. Clairsville exploded for 19 points in a 2:26 span in the second period, allowing the guests to coast to a 47-6 win over the Meigs Marauders Saturday evening before a small, wet, damp crowd at Farmers Bank Stadium in Meigs County. Two lost fumbles figured into the equation as the Marauder offense had trouble all evening getting things rolling. 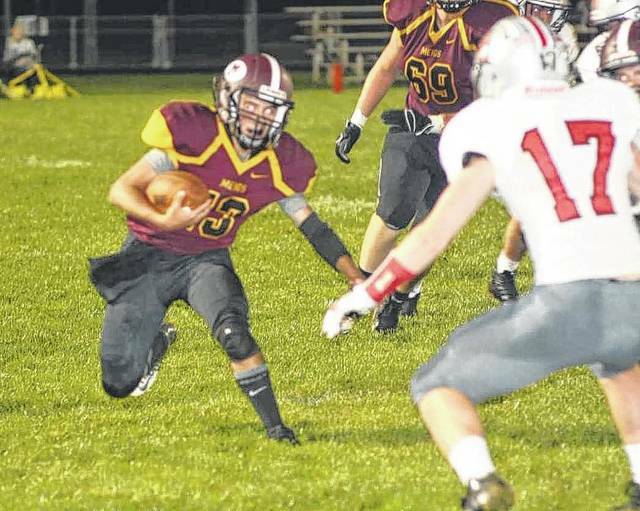 The Red Devils held the Marauders to only three first downs, 13 yards rushing and 73 total yards of offense. After a scoreless first period, the Red Devils scored with 11:15 left when Craig Bober pulled in a 10-yard pass from Dustin Carrothers. Matt Greenwood made the extra point for a 7-0 Red Devil lead. Two plays later, the Marauders fumbled and the Red Devils recovered at the Meigs 13. Four plays later, Carrothers kept it on a quarterback sneak for a 13-0 St. Clairsville advantage. The Red Devils made short work off a short Meigs punt, taking over at their own 35, Carrothers founds J. Heatherington over the middle for 65 yards and the score. Less than two minutes later, the Red Devil explosion continued as Aaron Jordan scored from 11 yards out. A successful extra point made it 27-0. The SCHS lead grew to 34-0 when Carrothers hit Bober from 19 yards out with just 20 seconds left in the half. A 63-yard run by Luke Watt made it a 41-0 lead just two minutes in the second half, which was played with a running clock. Meigs scored with 4:48 left in the third period when Zach Bartrum caught a two-yard pass from Cory Cox. The Red Devils made the final 47-6 with 11:07 left in the contest when Kenya Robinson scored from 28 yards out. The Red Devils rushed for 261 yards on the evening, with Luke Watt leading the way with 68 on two tries. Carrothers was 6-of-9 in the air for 132 yards. Bober had four catches for 52 yards, while Heatherington had two for 80. Mathew Brown led Meigs with six carries for 19 yards, Cox was 5-of-8 in the air with an interception for 58 yards. Bartrum had three receptions for 50 yards. St. Clairsville (1-1) will return home next to host Meadowbrook, while the Marauders (1-1) travel to Logan. Meigs sophomore quarterback Cory Cox runs for yardage during the second half of Saturday night’s Week 2 football contest against St. Clairsville at Farmers Bank Stadium in Rocksprings, Ohio.